The game that I’m reviewing is none other than Skyrim. This is the fifth game of the Elder Scrolls series. The game developer, Bethesda, has created another masterpiece with their skills in pro-gaming. I wouldn't be at all surprised if the people who developed it have design degrees. As such expertise in gaming is not just brought about by the love of gaming , but can only be honed by expert game making tutelage. The game of Skyrim is all about fighting dragons and finding out that your character has the power of shouts that kill other enemies in your way. This is because your character’s ‘Dragonborn.” Your objective is to kill all of the dragons that are attacking the country of Skyrim and also, (you are) letting your player do some side Quests. The graphics in Skyrim are amazing! They have colors that aren’t bright but matches the environment your character’s in. In caves, it is dark and mossy with torches only showing light. In the snow biome, tall mountains are the only thing that blocks your path. Also, when you look in the sky, you see mountains. But those aren’t backdrops, even though they are so far away. They are real, and you can actually climb all the way up those mountains. 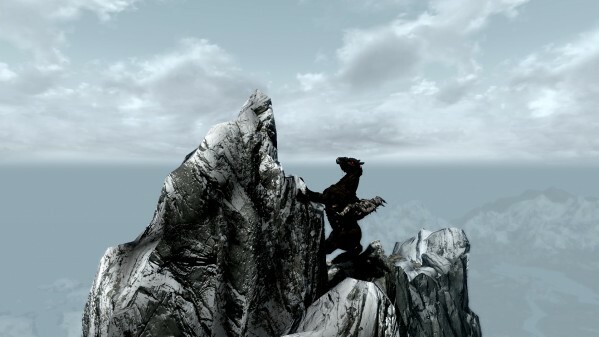 A Horse on Skyrim's Highest Mountain! The sounds in the game are based on situations your character is in. Like, if you are hit, you will hear a groan or if someone talks to you, you hear them talk with an accent because the game is based on Medieval times. Since this game is new, it is $60, even though it is worth a million (dollars). The rating is M, and I would recommend this game to people who like realistic gameplay, open-world adventures, and action-paced fighting and slaying (of) dragons.